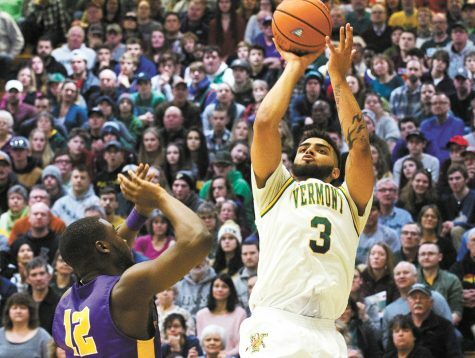 UVM men’s basketball team beat the University at Albany 67-49 Feb. 9. This win gives the Catamounts a 19-5 standing this season and is their fourth consecutive win, according to UVM athletics. In the America East conference, UVM has a 9-1 standing, according to UVM athletics. 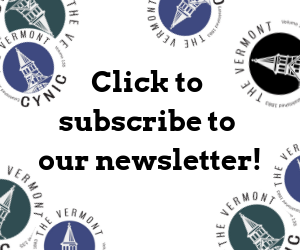 UVM took possession first, but Albany put the first points on the board. Junior forward Anthony Lamb quickly struck back, tying the game at 2-2. Five minutes into the game, senior guard Ernie Duncan scored a 2-point shot on the last second of the shot clock. An Albany player then drove to the net and was fouled by Lamb, which gave Albany two free-throws. Duncan later drained a 3-point shot, bringing the score to 7-8, with Albany still holding the lead. 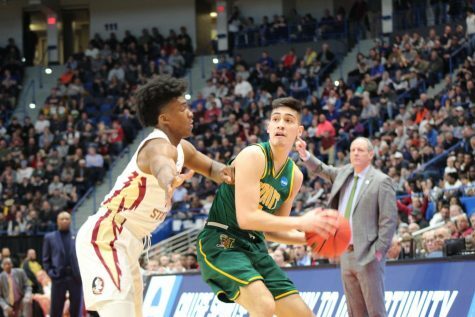 Shortly after, Vermont committed a personal foul and Albany was given three freethrows. However, these points were quickly answered by a 2-point basket by Lamb, which brought the score to 9-10. 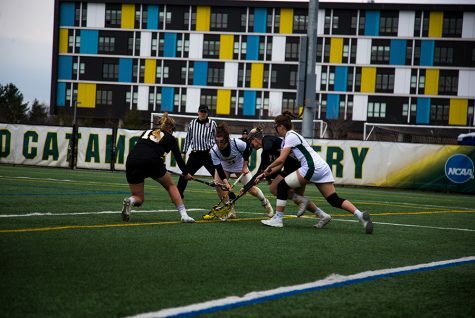 UVM obtained the lead with 10 minutes remaining in the first half because of Lamb’s 2 pointer, bringing the score to 13-12. After a string of personal fouls by both teams, UVM won the ball with nine minutes to go in the half. With five minutes left in the first half, first-year guard Robin Duncan sunk a 3-point shot, increasing UVM’s lead to 18-14. This was quickly followed by a 3-point shot from Lamb, bringing the score to 21-14. Later, junior guard Everett Duncan made a 3-pointer and increased Vermont’s lead by 13 points. At the end of the first half, Vermont led 30-21. Two minutes into the second half, senior forward Samuel Dingba blocked a jump shot, giving UVM possession and garnering applause from the fans. Five minutes into the second half, UVM had increased their lead to 16 points. Head coach John Becker said the team gained momentum during the second half. 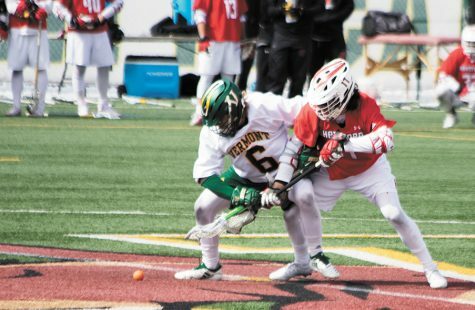 “The offence took a little while to get going, but the first eight minutes of the second half we really came out and found a nice rhythm,” Becker said. Ernie Duncan sunk a 3-point shot, which brought the crowd to its feet. Sophomore Moira Mahoney was among the fans who stood up after Ernie Duncan’s shot. 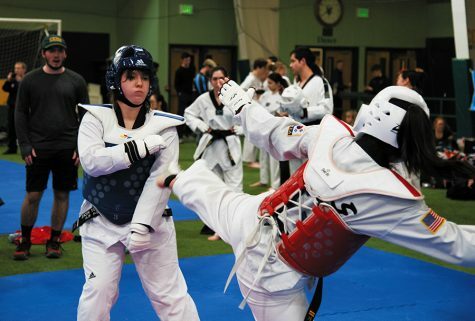 First-year Madeline Spear also said that the shot was extremely impressive. “I’m not really a huge basketball fan, but you could tell that that was a good shot,” Spear said. With nine minutes left in the game, Lamb scored another 2-pointer. 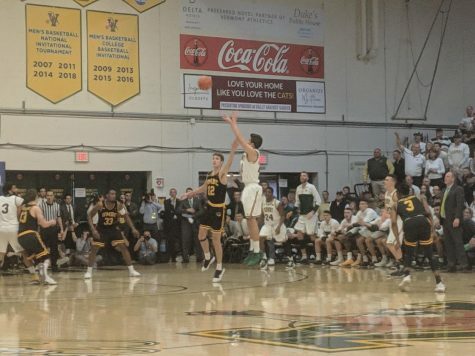 Lamb was then fouled and sunk both freethrows, increasing UVM’s lead to 65-42. Becker said that there was still room for improvement, even with this win. 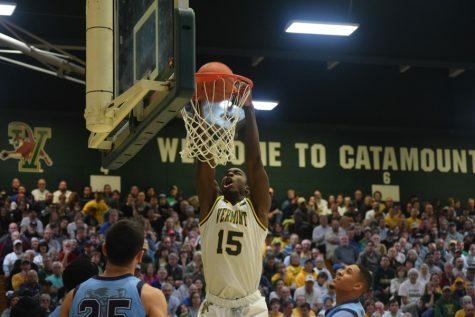 UVM’s next game is 7 p.m. Feb. 13 at home against the University of New Hampshire.